While all of this has undoubtedly been extremely cool (and we’re holding our collective breath for more data), there’s a lot of work that remains to be done. We need accurate predictions of the quantity and composition of material ejected in mergers in order to fully understand the origin of the heavy elements, and to say whether BNS mergers are the only r-process site. To investigate such questions, we require theoretical models that include all the relevant physics. Today’s paper presents the largest set of NS merger simulations with realistic microphysics to date. By realistic microphysics, we mean that the simulations also take into account what the atoms and subatomic particles are doing. This is done by using nuclear theory based descriptions of the matter in neutron stars, and by including composition and energy changes due to neutrinos (albeit in an approximate way). Modeling BNS mergers is a complex multi-dimensional problem. We need to simulate the dynamics in full general relativity, along with the appropriate microphysics, magnetic fields and neutrino treatment. 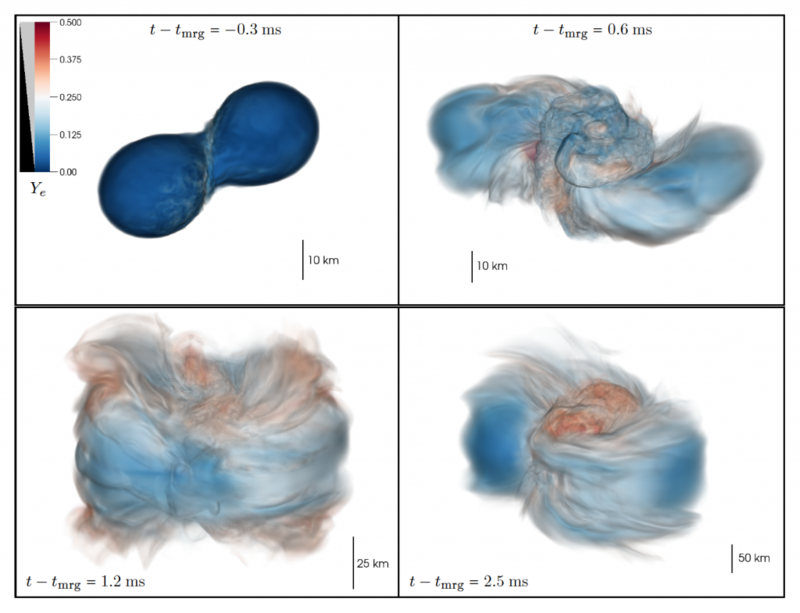 Remarkable progress has been made, particularly in the last decade, since the first purely hydrodynamical merger simulations were carried out. Still, the problem remains extremely computationally expensive and simulation efforts have traditionally focused either on carrying out general relativistic simulations while sacrificing microphysics, or on incorporating advanced microphysics with approximate treatments of gravity. If you care about the merger dynamics and the dynamical ejecta, i.e., material ejected close to the time of merger due to tidal interaction and shocks, you need fully general relativistic simulations, like the ones presented in today’s paper. The authors carry out 59 high resolution numerical relativity simulations, using binaries with different total masses and mass ratios. They also use different descriptions of the high density matter in neutron stars. Neutrino losses are included in all cases, while some simulations include neutrino reabsorption as well. A few simulations even include viscosity. The authors systematically study the mass ejection, associated electromagnetic signals, as well as the nucleosynthesis from BNS mergers. Fig 1. Electron fraction for an example simulation. The neutron stars are 1.35 Msun each and neutrino reabsorption has been included. The bulk of the ejecta lies within a ~60 degree angle from the orbital plane. Figure 2 in the paper. Fig 1 shows the electron fraction of the material in one of the simulations over time. First, material is ejected due to tidal interactions, close to the orbital plane. Next, more isotropic, shock heated material is ejected. This component has higher velocity and quickly overtakes the tidal component, as seen in the figure. The two components interact and the tidal component gets reprocessed to slightly higher electron fractions. The authors also find a new outflow mechanism, aided by viscosity, that operates in unequal mass binaries. This ejecta component, called “viscous-dynamical ejecta”, is discussed in detail in a companion paper. Using their results, the authors fit empirical formulas that predict the mass and velocity of ejecta from BNS mergers. Even more material can become unbound from the remnant object on longer timescales (“secular ejecta”), but is not the studied here due to the high computational costs of running the simulation for that long. The authors study in detail how the r-process nucleosynthesis depends on the binary properties and neutrino treatment. Sample nucleosynthesis yields are presented in Fig 2. You’ll notice that the second and third r-process peaks are robustly produced while the first peak shows more variation. In fact, the first peak is quite sensitive to the neutrino treatment as well as the binary mass ratio. Fig 2. Electron fraction (left) and nucleosynthesis yields (right) of the dynamical ejecta. “A” refers to the mass number of the nucleus. The different colored lines represent binaries with different mass ratios. The green dots show solar abundances. Figure 19 in the paper. The radioactive decay of the r-process nuclei produced powers electromagnetic emission, referred to as a “kilonova”. Other electromagnetic signals can also be produced due to different ejecta components. The authors compute kilonova curves for all their models. They find that binaries that form black holes immediately after merger do not have massive accretion disks and produce faint and fast kilonovae. When the remnants are long-lived neutron stars, more massive disks are formed and the kilonovae are brighter and evolve on longer timescales. Example kilonova curves are shown in Fig 3. Fig 3. Kilonova curves in three bands for three different models: binary with prompt BH formation (left), binary forming hypermassive neutron star (middle), binary forming a long-lived supramassive NS (right). Solid and dashed lines correspond to the viewing angle. Figure 24 in the paper. The authors also compute the synchrotron radio signal due to interaction of the ejecta with the interstellar medium. Example radio lightcurves are shown in Fig 4 along with the afterglow in GW170817. A small fraction of the ejecta is accelerated by shocks shortly after merger to velocities >0.6c, producing bright radio flares. The flares can probe the strength with which the neutron stars bounce after merger and in turn probe matter at extreme densities. Some of the models predict that the synchrotron signal from GW170817 will rebrighten in months to years after the merger! Fig 4. 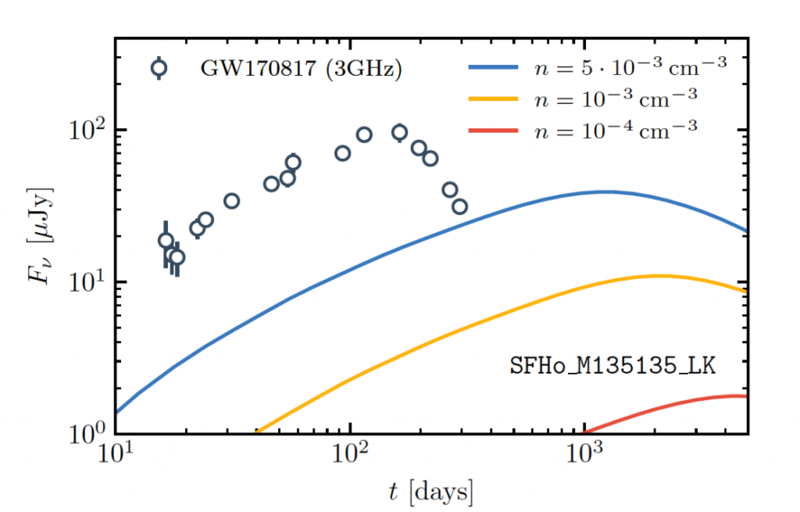 Radio light curves of the dynamical ejecta of one model at 3 GHz, compared with GW170817. The ISM number density n is a parameter of the model used for generating the curves. Figure 30 in the paper. Systematic investigations are key to understanding complex events such as neutron star mergers. Improved theoretical modeling, with a push towards incorporating all the relevant physics in merger models, will not only help us understand what we saw last year but also set us up for the next set of observations! I'm a grad student at North Carolina State University. I'm interested in extreme astrophysical events like core-collapse supernovae and compact object mergers.